In this, the first episode of the Pantscast, we hear a joke from Edward Mullany, then I introduce the show and what I like about the podcasts I’ve been listening to, and then I talk a little bit about Ebook Flights, the new ebook-only book program from Publishing Genius. The keynote of the show is my conversation with Michael Kimball. We talk about the writing life, how writing can be taught, and a little bit about softball. Here’s a link to Ebook Flights. Listen to the show to find out how you can download them for free. And here’s a link to Michael Kimball’s recent essay at FastCo, about how he came to write The One-Hour MFA, which we just started serializing here for free. The opening music is by the Rah Brahs. Movie Times Ep. 2: "Magic Mike XXL"
In this episode we discuss Joe's movie pick, Magic Mike XXL, male bodies, female desire, and whether or not Joe should shave his chest and learn to dance. Movie Times Ep. 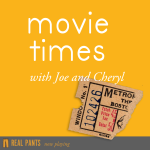 1: "Inside Out"
In this episode, Joe and Cheryl discuss "Inside Out."